"A maverick novel, skillfully and wisely written... Golden State is both inspiring and questioning, daring and provoking." Emmanuel Itier, Buzzine Arts. "A great craftsman, author David Prybil's genius is getting inside the heads of common people ... and creating a time capsule (2003-2006) of heartbreaks and errant ways. Studded with comic situations and touching self-revelations, it will keep readers breathless... I suggest you buy the book on a weekend without any other obligations and keep reading all the way to the end." Karen Dahood, reviewer, Book Pleasures. To read the full review, click here. "A well-written novel that successfully combines comedic twists with tragic consequences, Golden State is a delight to read. Five out of five stars." -TB Markinson, Self Publishing Review. "What do you get when you combine a co-dependent woman from a trailer park who looks for love in the prison pen pal classifieds, a miserable writer who pounds out obituaries in the office basement but finds light in his newfound stripper crush, a widower who laments on lost days and lingers in daydreams while selling tuxedos, and a controlling realtor who seeks self-worth through sales- manship while making everyone around her feel rejected? 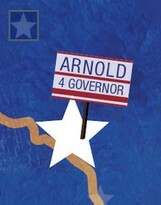 Let's also add a dash of a crazy governor's race where an equally colorful lineup of characters runs for office, the brightest hue being Arnold Schwarzenegger. Mix all of these elements together and you have one hilarious, as well as promising, unveiling in Golden State. Prybil has created a motley crew of characters who writhe from the page against the backdrop of a state in need of change. The characters' agony, triumphs, and ever-present hope in the American Dream is heartfelt and achingly honest... [and] filled with dialogue and storylines that gleam." Heidi Komlofske, San Francisco Book Review, March 2011 issue. "A well-written and informative novel... filled with characters that readers truly feel like they know... [Golden State] offers dearly genuine laughs and subtly reflects how politics are just another cog in the media machine, whether or not a movie star is at the helm. Considering the current state of the world, not to mention the recent Arnold love-affair fiasco, readers should have no problem grasping what the American Dream now equates to in the eyes of middle-class America." Lucy Tonic, Yahoo! /Associated Content, Fiction and Culture Critic. To read the full review, click here. "Golden State takes a ridiculous chapter in California's recent history and gives it a soul. It's a fresh, entertaining read, and a promising debut by Prybil." James Frey, author of Bright Shiny Morning and A Million Little Pieces. "I finally read Golden State and I loved it, David. Thought I'd say so on here for the world to see it. Damn thing rushes along like a fine, funny, rousing wind. Congratulations." Walter Kirn, author of Up in the Air, Mission to America, and The Last Meritocracy. "It's been said that in politics, "As California goes, so goes the nation," and the years following the period encompassed in Golden State have borne this out. David Prybil's work is prescient, and also very funny." Michael Cahill, author of A Nixon Man and writer-director of King of California. "David Prybil is a writer of refined talent. Golden State is funny, fast, rueful, and heartfelt. It is a marvelous and engaging debut novel." DeLauné Michel, author of The Aftermath of Dreaming and The Safety of Secrets. "A whip smart chronicle of that crazy time in California politics -- David Prybil's Golden State hums with a multitude of dreamers, schemers and ordinary folks caught up in the recall election that resulted in a movie star and former bodybuilder becoming the governor of the most populated state in the union. Golden State reminds us that, yes, It really did happen." Elwood Reid, author of If I Don't Six, D.B. and Midnight Sun. "Golden State takes you on a romp through the lunacy we call California. Highly entertaining, replete with strivers, dreamers, and insightful humor, this novel is also a moving story that at its core is all about heart." Scott Lasser, author of Battle Creek and Say Nice Things About Detroit.